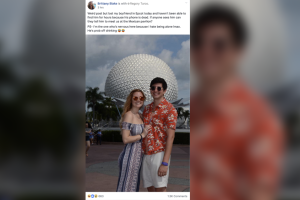 ORLANDO, Fla. — It was real-life "Where's Waldo?" In this case, Blake was the one to lose her boyfriend. “That shirt is very distinctive. Someone should be able to spot him,” Nikki Goodfellow posted with laughing faces following her comment. 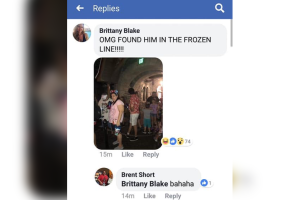 Most of those commenting were making fun of Blake for losing her adult boyfriend at the World Showcase, but others truly wanted to help track Turco down. 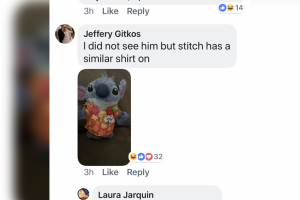 Turco was wearing a shirt awfully familiar to fans of "Lilo and Stitch." 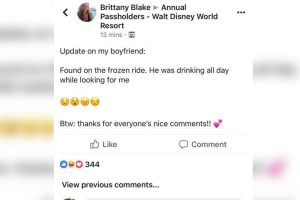 Yet, with 15 minutes until the park closed, Blake’s lost boyfriend was still missing. Not only was she getting worried, but group members were wanting answers. “Following - need to know how it ends! Where does she fin him? Does someone else find him first? 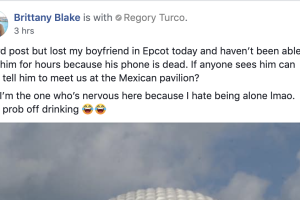 Tune in for the case of 'The Lost Boyfriend, Epcot Edition,' " Barbara Rush commented. 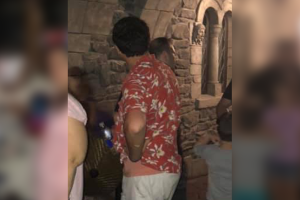 Of course, there was the practical Disney goers too, who said they always have a plan just in case this same situation happens to them. Where any 20-something-man would be of course — the line for the "Frozen" attraction. Another happy ending. After all it is the happiest place on Earth, right?